The CSS Albemarle, an ironclad ram, was one of the Confederacy's most successful ironclads. This vessel and its sister ship, the CSS Neuse, were designed to wrest control of North Carolina's sounds from the Federal forces that had dominated the region since early 1862. The Albemarle was a twin propeller ship mounting two 6.4-inch Brooke rifles in an armored casemate. Construction of the new ironclad began in a cornfield at Edward's Ferry on the Roanoke River in January 1863. To ensure rapid completion of the Albemarle, the Confederate navy sent its chief builder (and designer of the ship) John L. Porter to oversee construction. Abandoned railroad rails were scrounged from across the state to be rolled into armor plates, and sawmills and a blacksmith shop were established on site. The work was aided by a newly developed drill that reduced the time for drilling holes in the armor plate from 20 minutes to 4 minutes. In late 1863 Cdr. James Cooke was sent to take over Porter's supervision duties. Cooke, who would later command the Albemarle in action, became known as the "ironmonger captain" for his relentless efforts to gather iron of all sorts that could be rolled into plating. But despite all attempts to accelerate the vessel's construction, there were delays. The keel of the new ship was damaged during launching, requiring extensive repairs, and railroad delivery of iron from the foundries was exceedingly slow. By April 1864 the gunboat was nearing completion. Brig. Gen. Robert F. Hoke was planning an infantry attack on the town of Plymouth near the mouth of the Roanoke and required the cooperation of the ironclad. Early on 17 April, as Hoke's infantry assaulted the outermost Union positions, the Albemarle started out. Workmen swarmed over its deck and casemate to fasten down the last layer of armor even as it steamed downriver. While under way the engines broke down, necessitating several hours of repairs. Finally, the ship reached Plymouth early on the morning of 19 Apr. 1864. Waiting for it were the USS Miami and Southfield, the most powerful of several wooden gunboats at Plymouth. Chains had been strung between the two ships in an attempt to ensnare the Albemarle and batter it with their combined fire. But Cooke recognized the trap and avoided it. He then made for the Southfield, plunging the ironclad's armored bow deep into the wooden vessel and sinking it so quickly that the ram almost followed the victim. The Miami, along with the other Union gunboats, soon withdrew after shot and shell from its 6.4-inch rifles and 9-inch smoothbore guns glanced harmlessly off the Albemarle's four inches of iron plating. With the opposing fleet dispersed, the Albemarle bombarded the last remaining strongholds in Plymouth, helping force a Federal surrender. Hoke next focused his attention on New Bern. The ironclad Neuse had run aground en route to New Bern, and so the Albemarle was called upon to provide naval support for the operation. On 5 May it steamed out of Plymouth, but as the rebel ironclad reached Albemarle Sound, 7 Federal gunboats mounting a total of 55 guns attacked. The massed artillery of the fleet failed to penetrate the armor, but the Albemarle's smokestack was nearly destroyed and the muzzle of one gun was shot away. In the melee the Albemarle itself was rammed by one of the wooden gunboats. Its steering gear was damaged, and, because of the mangled smokestack, it was necessary to feed bacon, lard, and butter into the boilers to keep up steam pressure. Despite having damaged each of the Federal ships, Cooke had no choice but to limp back to Plymouth. 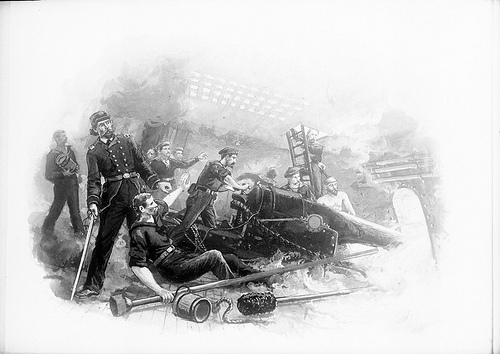 The Albemarle was repaired and remained at its mooring until 27 Oct. 1864, when it was sunk by a torpedo in a daring raid led by Lt. William Cushing. With their ironclad gone, the Confederate forces evacuated Plymouth on 31 October. In March 1865 the Union navy raised the ship and towed it to Norfolk, Va., the following month. The Albemarle remained an officially commissioned U.S. Navy ship until 15 Oct. 1867, when it was sold at auction to J. N. Leonard and Company for $3,200. Gerard, Philip. "The Invincible Ironclad." Civil War Series. Our State. December 2013. http://www.ourstate.com/invincible-ironclad/ (accessed February 24, 2014). Elliott, Gilbert. "The Career of the Confederate Ram 'Albemarle'." The Century Magazine. 36, no. 3 (July 1888). 420-432. http://books.google.com/books?id=7zKgAAAAMAAJ&pg=PA420#v=onepage&q&f=false (accessed February 24, 2014). Stempel, Jim. The CSS Albemarle and William Cushing: The Remarkable Confederate Ironclad and the Union Officer Who Sank It. McFarland, 2011. http://books.google.com/books?id=6D8Z2xz0U9kC&pg=PP1#v=onepage&f=false (accessed February 24, 2014). William Francis Martin Papers, 1787-1884 (collection no. 00493). The Southern Historical Collection. Louis Round Wilson Special Collections Library. University of North Carolina at Chapel Hill. http://www2.lib.unc.edu/mss/inv/m/Martin,William_Francis.html (accessed February 24, 2014). Elliott, Gilbert. "Little Charles" and "Albemarle": two episodes in a family story. Kingston, N.Y.: G. Elliott. 1962. Elliott, Robert Garrison. Ironclad of the Roanoke: Gilbert Elliott's Albemarle. Shippensburg, PA: White Mane Pub. Co. 1994. "Component, Watercraft, Accession #: H.1914.266.1." 1861-1865. North Carolina Museum of History. "The Albemarle under construction." From the General Negative Collection, North Carolina State Archives, Raleigh, NC., Call #: N_51_11_3. Available from http://www.flickr.com/photos/north-carolina-state-archives/4290829640/ (accessed May 15, 2012). "Albemarle- Closeup with Men and Cannons." From the Barden Collection, North Carolina State Archives, Raleigh, NC., Call #: N.53.15.1667. Available from http://www.flickr.com/photos/north-carolina-state-archives/4290828970/ (accessed May 15, 2012).